Does your grocery store have a lot of buy one get one free sales? While those sales are awesome, how much chicken can your family eat before it goes bad? As much as you want really. That’s the beauty of freezing food. If you follow a few simple guidelines, you can save a bundle stocking up when there is a sale and freezing things for later. 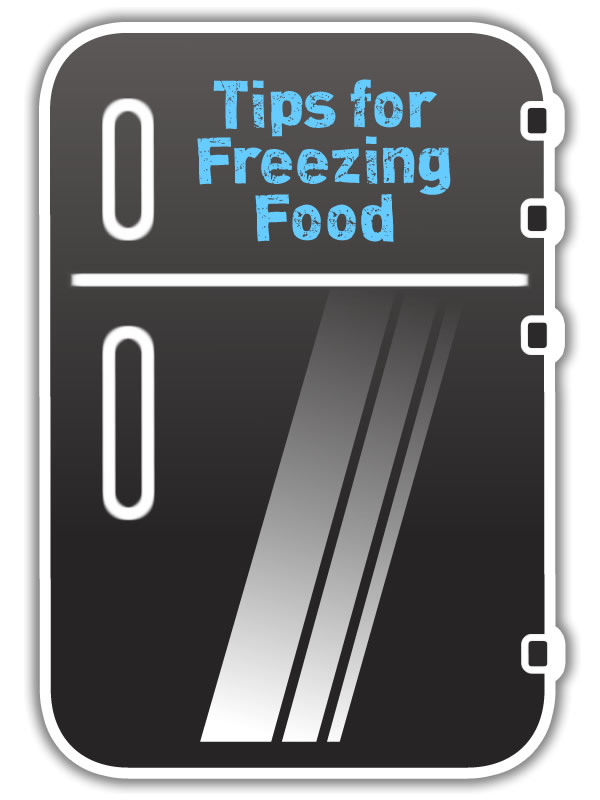 Here are some tips for freezing food. Almost anything can be frozen with the exception of salad vegetables – like cucumbers, tomatoes, and lettuce. You can freeze them too, but they don’t really thaw well. Tomatoes will be mushy and lettuce will be wilted. The high water content in the cells of these fragile veggies makes them burst and turn into a watery mess when you thaw them. That’s why you find that most of these vegetables are canned or jarred. You can freeze tomatoes and crush or puree them for soup if you’d like, but that freezer space is probably best used for things that thaw well, like meat, cheeses, and beans. When in doubt on whether something freezes well, think about how you’d find it in the store. Would it be in the frozen food section? If not, it’s probably not something you want to freeze. How long can you freeze things? A good rule to follow is to leave nothing in the freezer for more than 2-3 months. There are things that can be frozen for up to 12 months, such as a large pork roast, but if you stick to the 2-3 month rule, you don’t have to remember the shelf life on everything. Thanks to the internet, you can always do a quick search to find out if something has been in the freezer for too long as well. How do you make sure it lasts? When you put food in the freezer, make sure it’s in an air tight container. Take it out of the store packaging and put it into your own, and write the date on it for later reference. Many people like to use the FoodSaver System* . It’s a vacuum sealer that takes the air out of the bag, prolonging shelf life and preventing freezer burn. Depending on the model, it costs around $100, but pays for itself in a short time. You can even get vacuum canisters to store sugar, coffee, and flour. If you don’t use a vacuum system, make sure you use freezer bags instead of regular resealable bags, and squeeze out as much air as you can. Have you tried freezer cooking? If you like soups and stews, consider freezer cooking. Basically, you take all the ingredients for something, cut it up just like you were going to cook it, stick it in one bag, and put it in the freezer. When it comes time to make the meal, you open the bag, dump all of the ingredients into your pot or slow cooker and move on with your day. It’s a great time saver. I do this with my cranberry chicken recipe. Freezing food saves time and money, and on days when you’re short on these things – we’ve all been there – opening the freezer to something delicious and ready to go is a blessing. Do you stock up on food and freeze it? Any tips to add? I have been wanting to try freezer cooking for a while now, but I just haven't gotten around to it yet. It's on my to-do list for sure though! These are some really great tips! I really want to do freezer cooking, but the food always gets freezer burn within a week or two. I'm not sure what I'm doing wrong. I push out as much air as I can. I'd love to figure it out though. This is a great idea and I've thought about it before but I didn't have time to do so. I think I'll give it a whirl. It'll save me money on lunches too.